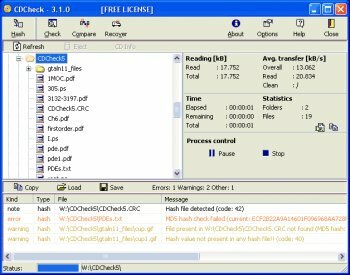 CDCheck is an application that checks your CD-ROM and tells you which files are corrupted. It can also do a binary compare with copy on disk. It is especially useful for testing old CDs or just burned CDs to see if they are OK. If some files are corrupted that means it would be wise to move your data to some other media or copy it on another CD. I use alot of freeware but I rarely write comment on anyone. But I really want to write a comment on CD check..coz it really work! I got a VCD which has a serious scratch mark what had been done by my 1.6 year old son (well he just played the VCD like UFO..nothing much) and his most favorite Elmo VCD could not be read at all. I used a lot of freeware or shareware, trying to convert or copy to my PC..all said they were the best however the VCD still couldnt pass through and kept loading on the scratch mark. But when I used CD Check, it successfully read the VCD and copied to my PC without hanged! Thanks BN you really do a good job! and It is Free! Yes & Free. Just need to register this app. xmas, & had a loved anime series burned on about 50 Cdr's. I wanted to load them back to my pc to create long play file DVD's all in avi format to play on my DVP to watch on tv. Well I ran into several discs with read errors & that sucked. Now i would have an incomplete series. This great app rescued my video files. As I write this review I am loading my rescued avi files to dvd.. This is a must have app..
CDCheck 3.1.14.0 is available on CDCheck website. Comment: This version brings only a few small changes. The most important are probably better default settings for buffers which should speed up CDCheck. I never had problems with CDCheck. Essential after burn my backups! killed my lg 8521b cdrom while scanning. get away from this prog. i m not lying. Have been using it for years. The leader in it's class. Yes, it is FREEWARE but you can make a donation at your own choosing. ArabianNight is right, if it has a timeout, it's not really freeware. I don't feel free with limitations. As already said, you can get free license for a life time :D I have used this program already for years, its must be for everyday burning, check (compare) your cd before you delete it from hdd !!! "If you decide not to purchase a license, you should request Free license from CDCheck ONLINE!" This is an unusual policy, surely, but not an entirely unheard of one, and not one that would justify a minimal rating, for the application is quite good at what it does.